These black floor vents are the perfect durable register for those looking for something modern and simple. The Rockwell decorative air registers have a steel damper to adjust your rooms airflow and also had a 3mm steel faceplate. The black floor vents are finished with a powder coat which helps to protect the faceplate. Our decorative air registers are not only simply designed, but they are simply installed; just drop them into your floor opening. Convert these black floor vents into wall vents by reading the instructions below and remake your entire house or office with one order! The modern design on these decorative air registers is sure to please. Tip: Our 2 x 12" black floor vents will fit into a hole opening of 2 x 12". 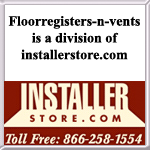 To order our decorative air registers, measure only the floor hole opening. All of the black floor vents can be used as wall register but will need to be mounted with wall mounting brackets. Do not use on the ceiling. We have black floor vents in other styles, should you desire something other than the Rockwell design. Order some decorative air registers today in this classic color and revamp any room!